This tank houses a male Wolf Cichlid, Parachromis dovii. Filtration Eheim Pro-II 2028 external canister filter (rated for 132 imp gal), and Eheim 2010 internal filter, plus two large airstones. Lighting Medium - fluorescent room lighting only. Decor Rounded boulders, bogwood and a large Beech branch. Background 3-D effect artificial background roll. 35% water change every week. Fish stock A male Wolf Cichlid Parachromis dovii, currently about 35cm (14") in length. 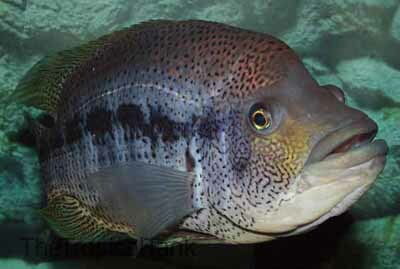 There aren't many fish that I would devote a whole large tank to, but this very large and robust cichlid from Central America is a character that more than earns his place.